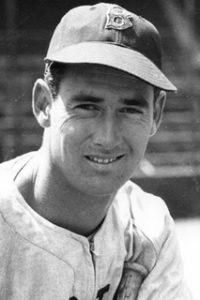 Yesterday was the 100th anniversary of the birth of Ted Williams. The Greatest Hitter Who Ever Lived. Teddy Ballgame. The Splendid Splinter. There simply was no other like Ted Williams. Hitting savant, pilot, war hero, fly fishing guru. This guy could do it all. Except play defense, but nobody was tracking those things in Ted’s day. My tweet yesterday from @MOCmathclass suggests that one peruse baseball-reference.com and just marvel at the stats complied by Mr. Williams. Yeah, take a minute and do that. I’ll be right here. That’s for the left side of the brain. If you want to be entertained, head to Spotify or Amazon and check out The Baseball Project’s little ditty about The Kid. The name Ted Williams is in there, and there may be a four-letter word in there too. It was a little much for Twitter, but here we don’t judge. Was Ted kind of a jerk in real life? Maybe. And I’m guessing he didn’t really care. There goes the greatest hitter who ever lived.